Perhaps you’re in need of day away from the beach or maybe you’re feeling adventurous and want to explore. No matter what your reasoning may be, the quaint community of Cocoa Village offers unique shopping opportunities and almost endless entertainment for visitors. The tree lined streets of Historic Cocoa Village display old-fashioned Southern charm and hospitality. If you’re planning a trip to Florida’s Space Coast, make sure you don’t overlook this charming historic district. Shopping – If you’re looking for unique finds, Historic Cocoa Village is your shopping destination on Florida’s Space Coast. Find clothing at Mangos Fashion Boutique, jewelry and gifts at The Mint Mermaid, home décor at The Pear Tree and art at one of the many art shops throughout the area. Dining and Nightlife - After a day of shopping, relax at one of Cocoa Village’s many restaurants. There are countless options to satisfy your taste buds. Sushi, burgers, and pizza, to name a few, are popular options, as well as Crush 11, which serves up rustic-urban food and quality hand-crafted cocktails. After dinner, head over to the Village Idiot Pub, grab a cold drink and play one of their many board games available while listening to live music. Festivals and Fairs - The 13th Annual Brevard Caribbean Fest on Sept. 4, 2016 showcases Caribbean food, live music and entertainment for the whole family at Riverfront Park. Historic Cocoa Village is also hosting the 34th Fall Art and Craft Festival Saturday Oct. 17 and Sunday Oct. 18. Visitors can view the works of artists and crafters while trying gourmet treats from food vendors. 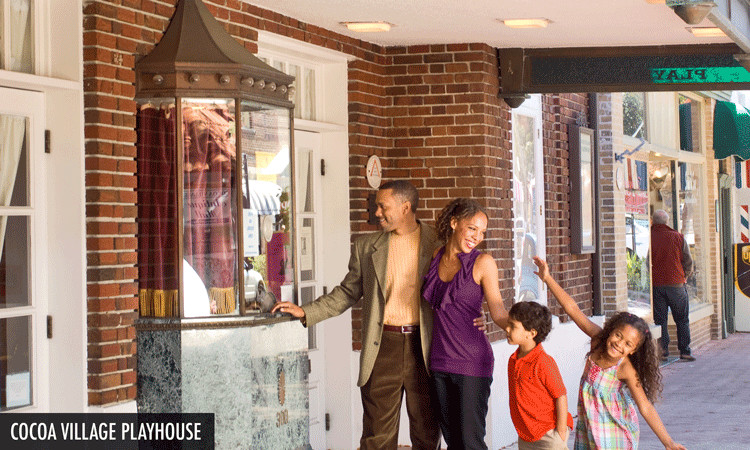 Shows - Established as the Aladdin Theater in 1924, the Historic Cocoa Village Playhouse first entertained the public with silent movies. Now a thriving community theater, staff and volunteers are entering their 27th season of “Broadway on Brevard.” Individual tickets for the 2016-2017 season open to the public Sept. 6. Put Historic Cocoa Village on your checklist and mark it off during your next visit to Florida’s Space Coast. For more information about this area, please click here.